History and the Facts Are on Your Side--Use Them! The City of Doubt--Washington, D.C. Appendix: "Your Purpose in Life"
To God, who continues to bless me beyond my wildest dreams. To my family and wife, Gloria, for all their love, support, joy and even laughter, especially when I get too sleepy and make no sense at all. MATT CARROTHERS for his invaluable collaboration, research skills and dedication to the timely completion of this project. Ericka Pertierra, Karleen Mahn and Joel Ricks for their brutally honest feedback, even if I did not like it. Mary and Eric Tanenblatt for making their "hideaways" available for my writing retreats. All of the staff, financial donors, and faithful volunteers who worked on the Cain for U.S Senate Campaign of 2004. All of the voters in Georgia who voted for me and encouraged me to keep my voice and message heard. I hear you and stay tuned. Randy Evans for suggesting that I write this book. Stroud and Hall Publishers for their professionalism and willingness to truly be a partner in this project. Senator Zell Miller for his inspiration as a leader, a true statesman, and an unwavering speaker of the truth. To everyone who has prayed for me and my family. Thank you. Herman Cain writes "they don't get it." I think he should add to that "and they're gonna get it." Herman Cain writes that politicians are clueless about the average Joe, and folks are getting tired of it. Politicians who don't care for their constituents are going to be tossed out on their ears, as well they should be. Today's political arena needs leaders who know people, real people. Not the cookie cutter demographic techno-speak spat out by some pollster. Real people have real problems and need real solutions. But you can't lead toward the solution that the promise of America holds out if you don't know or care about the voters. What keeps them up late at night? What are their struggles? What gets them up early? What are their dreams? 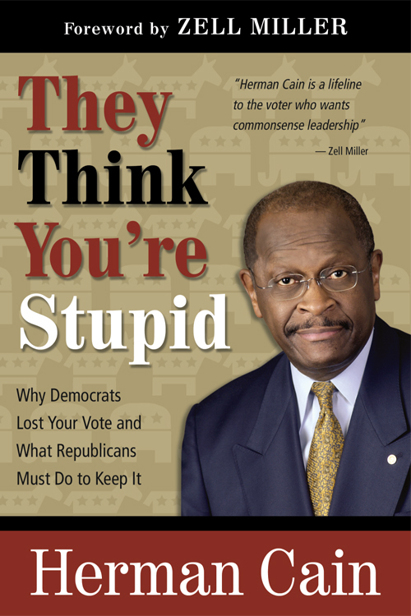 Herman Cain knows and has proven that the voting public is neither stupid, nor are they giving up. When he ran in the Republican primary for the U.S. Senate in Georgia, the political "experts" wrote Cain off as a novelty. For all the media's pride over its progressiveness, they don't know what to think of a black and conservative Republican other than "he's a novelty." How's that for respect? Herman Cain breathed a breath of fresh and honest air in a politics-as-usual race. He brought a platform based on true respect for the taxpayer, solutions based on the same kind of common sense that have made him a self-made business success story. Herman Cain also did something few politicians can duplicate. He brought in new voters. The politician who can bring new voters to the booth is reflecting the light of the American Dream itself. Herman Cain motivated college students with his message of responsibility and opportunity. Herman Cain attracted both Democrats and Republicans who were eager for a fresh start and some common sense. Cain writes that even though he didn't win the nomination, he didn't lose either. His goal was to serve the people of Georgia. He did more than that by ensuring the truly important issues were addressed during the campaign and not simply danced around with sound bites. It takes a steady man who is sure of himself not to be distracted by the needs of his own ego. You can know there's something good about a man whose ultimate goal is to help others by representing them well. All party leaders would do well to listen to him. Cain is onto something important for our future. The kind of democracy we have enjoyed for more than two hundred years won't survive voter apathy. When the voters' trust is lost, so is their support. To their own demise, many politicians play the politics-as-usual game and continue to think of voters as mindless and willing to follow anyone because of a few well-placed jabs and sound bites. Candidates from either party who are more concerned with how the party fares will find themselves with plenty of free time on their hands. Cain is the kind of man who is willing even to alienate himself from his own political party to do what's right. He ran for the U.S. Senate here in Georgia without the party bosses' blessing. He ran well. And it took a very good man to defeat him. I know something of what it means to be ostracized by party leaders, even from the party I've supported my entire political career. I also know something of the peace of mind that comes from doing the right thing and taking the right stand and holding the right ground. Doing the right thing can make a politician lonely at the Capitol, but satisfied in spirit. Herman Cain and his wise and proven leadership are a force to be reckoned with by politicians and a lifeline to the voter who wants common sense leadership but feels like an outsider in both parties. and its aim to educate and inspire the disenfranchised or "homeless" voter gives me hope. I'm on his side because I'm on the side of anyone who cares for this country with honesty, good horse sense, and strong character. Herman Cain is that kind of leader. This book is intended to be a wake-up call to both the Democratic Party and the Republican Party. If they both stay asleep at the wheel, then this book can become a mobilizing force for the millions of voters who feel politically homeless. Many people have a party affiliation as a practical matter, but more and more people are finding it harder to feel a deep sense of loyalty to either party. Party insiders will disagree, and therein lies the problem. They don't see that there is a problem. They see the next election and the next campaign. Party outsiders want to see more results. slim. I won an impressive second place in the Republican primary. It is this experience that has made me aware of the rising tide of the politically homeless. , evolved as I wrote. I have seen how many Democratic candidates distort, ignore, and even change the facts to try to get elected. Although Republicans are not innocent in this regard, their political capital is on the rise, and they have not backed themselves into an ideological corner that cannot be dramatically improved. In fact, my own party has a unique opportunity to dominate the political landscape for decades if they do a better job of reaching out to the party outsiders with results, rather than waiting for outsiders to reach in. It is my hope for this nation that the Republican Party will embrace some of the ideas that I present in this book in order to achieve sustained political dominance. For the politically homeless, the political outsiders, or the political dropouts, I hope this book gives you a renewed sense of hope that we do not have to settle for politics as usual and results as usual. on the big issues. I am now a graduate of "Stupid Anonymous" and want to share my awakening with others. I was never the smartest kid in class when I was growing up, but I was usually among the fastest learners. This has served me well in my business career, which many people would consider successful by most measures. For this reason, I have the nerve to express my views on the world of politics after only one run for elective office (U.S. Senate Republican 2004 Georgia primary). I finished second, but it was an impressive second. More importantly, I learned some valuable lessons swimming in the pool of politics while wearing the goggles of the business world. The Democratic Party is losing voters in droves, but those same voters are not joining the Republican Party in like droves. Democrats can't keep voters because their usual rhetoric has been exposed as empty. Republicans can't get these voters because their rhetoric doesn't resonate with many of them. These voters may be voting for Republicans, but they are not as truly Republican as those inside the party would like to believe. The elections of 2004 illustrate that the Democratic Party is between a rock and a hard place. One prominent Democratic governor believes the massive Democratic losses at the state and federal levels and the presidency were due to the party's failure to use the right words to communicate with the public. She has not yet realized that maybe the problem is the lack of content in the message. Political pundits, consultants, and analysts have tried to explain the 2004 election results by way of a swing group of voters. They are in denial that when more than one hundred million people vote, a majority of them are smart enough to think for themselves and not as a group. The Republican Party is also between a rock and a hard place. They won the presidency and control of both houses of Congress in 2004. The "rock" is the responsibility to lead and fix the big issues, which have gone unfixed for decades. The "hard place" is the prospect of being back in the minority in a few years if they choose to maintain the status quo in Washington, D.C. Voters are hungry for common sense, a sense of urgency, and real leadership. The Republican and Democratic parties have emerged as a two-"plantation" system in these early years of the twenty-first century. Both parties want voters to stay or join because of tradition or their intraparty rules, instead of offering clear and compelling ideological positions. They are moving farther and farther apart, leaving an increasing number of voters with a sense of being politically homeless. This group includes Democrats, Republicans, Independents, and registered non-voters who are put off by the scare tactics, deception, distortions, and lack of real new solutions to the biggest problems. who feel more and more disconnected to their traditional party affiliations and are uninspired by both Republicans and Democrats. These new voices come from all races, ages, backgrounds, and political affiliations. They have in common a desire to be inspired again by the promise of our great nation. New voices want political parties, political candidates, and elected officials to stop using the same decades-old political rhetoric and spin tactics against each other and on the public. They want solutions, not excuses. They want their president and their representatives in the U.S. House and Senate to place the interest of the people before the interest of the party. These new voices want leaders they can believe and believe in. records his realization that the Democratic Party had long ago left him, rather than the opposite. This book makes the case for why voters are not as dumb as Democrats think, and why voters are smarter than Republicans think. Too many people inside the major political parties have forgotten that we are all in the same boat now. Terrorists want to kill all of us. The current tax code and Social Security structure will bankrupt all of us. The Medicare mess is driving the costs of health care up and its quality down for all of us. We are all citizens of the United States of America first. These big, bodacious, unsolved problems are the enemies of us all. We are all in the same floundering boat. This book will also illustrate the factors responsible for the large and growing base of new voices. It will examine why conservative White Democrats and young African-Americans are leaving the Democratic plantation. I will also discuss why these voters do not immediately feel comfortable with the Republican Party and why Republicans experience difficulty inspiring many supporters in their traditional voter base. More importantly, this book will identify how this group of new voices can be informed and inspired to become a deciding force on major issues and solutions. advocating the creation of a third political party for those who feel politically homeless. Rather, my purpose is to force the existing parties and Congress to focus more on the history-changing big issues and their solutions and to use clear and compelling facts to engage the public. The party that does not embrace such a strategy is headed for extinction. Why? Because the public is waking up to "say-anything-to-get-elected" politics. They think we're stupid, but we're not. I also want to inspire voters to become more informed. We must all become more engaged in the critical issues our nation faces. If the new voices do not get more involved in the political process between elections, their elected and party officials have little incentive to change the nature of political campaigns or the status quo in Washington, D.C.
Life, liberty, and the pursuit of happiness are ideals we must protect. We must preserve these ideals with a more informed and inspired public. If we do not, we will not leave our grandchildren a mess--we will leave them a disaster. I believe in the "new nation" as conceived by our Founding Fathers. And I believe we can create a new day in the history of that new nation.